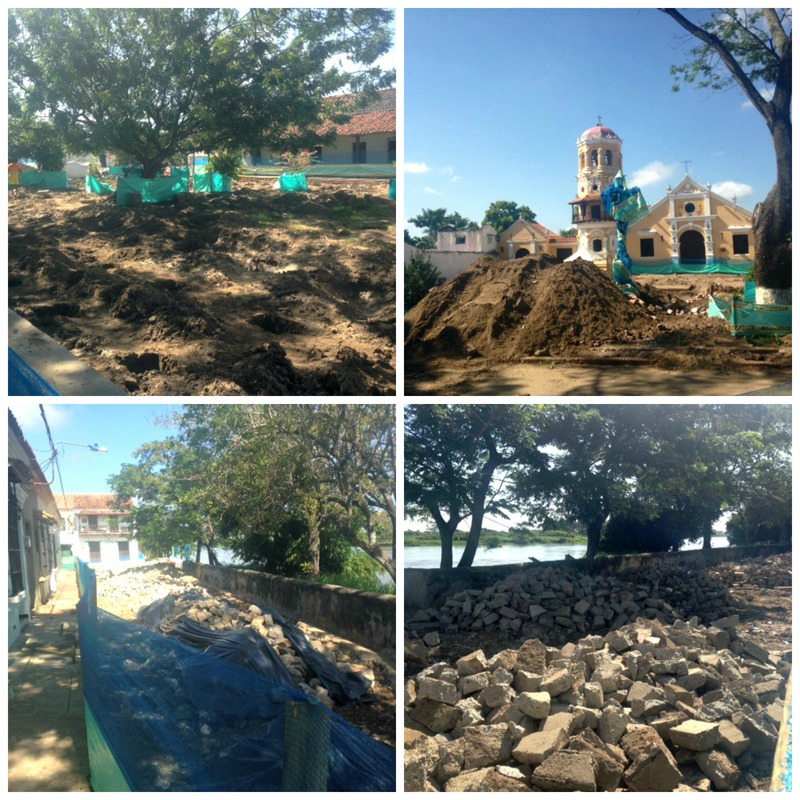 The second phase of Mompós’ restoration is now well underway and continuing work now extends all the way along the Albarada upriver from the Plaza de la Concepcion to the Casa Amarilla and passing the iconic Iglesia Santa Barbara. You’ll remember that I posted a blog on here in May 2012 regarding the first phase of the town’s restoration and this involved the principal plaza, that of La Concepcion. Despite the academic snobbery and resentment that surrounded the plaza’s refurbishment and inauguration, the project has been an overwhelming success and what was previously a dark, dank and dangerous place to go at night is now the town’s most family friendly and enticing square. 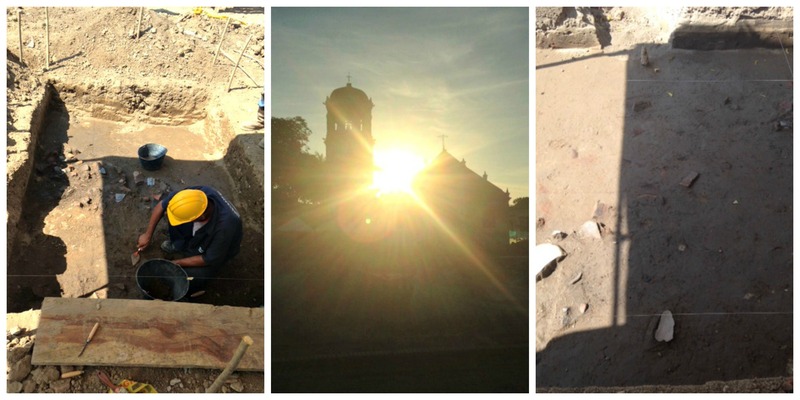 During the excavations in the Plaza de la Concepcion the workmen unearthed what appeared to be the remains of a pre Columbian cemetery just where the steps to the Iglesia de la Concepcion had previously been. Skulls were pulled out from the dirt as were various other bones, colonial era coins, cannon balls and fragments of pottery. As they break the thick concrete that has been poured haphazardly along the Albarada – the riverside walk – we know that there must have been some curious discoveries here too. And of course, the whole area of the Plaza Santa Barbara was dug up too. I took the opportunity to introduce myself to the archeologists on site and was invited in to see their digs the other day. Regardless of whatever archeological dig you are witness too, it will invariably feel like you are a second spear holder to the Indiana Jones character. I just wanted to get down there in the dirt with a toothbrush and begin unearthing human bones. Speaking to the experts is always an interesting proposition and so after taking a peek I asked them after their finds and while they are hopeful for more substantial discoveries, their feeling seemed to be one of disappointment. One archeologist let it be known that there was clearly a dearth of fully intact pieces here since the area had been dug up and paved on more than two or three occasions. This would explain for the arbitrary spread of historical details unearthed. Still, you cannot say that these are not exciting times for Mompós and since the Casa Amarilla is located on the edge of this work site, we have ringside seats to the show. Unusually the work seems to have progressed at a good speed and if the weather continues to remain dry, I should imagine that the first section of the plaza will be ready in time for Semana Santa 2014. 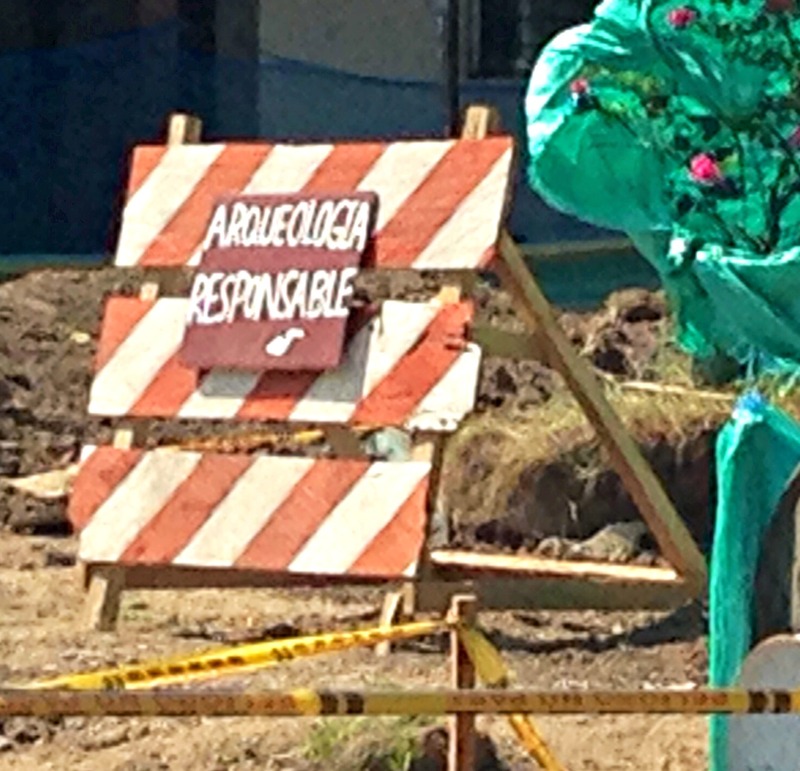 This entry was posted in Journalism, la Casa Amarilla and tagged albarada, archeology in colombia, archeology in mompos, casa amarilla mompos, colonial restoration, depresion momposina, iglesia santa barbara, la casa amarilla mompos, mompos, pre columbian remains in mompos, restoration of mompos. Bookmark the permalink.